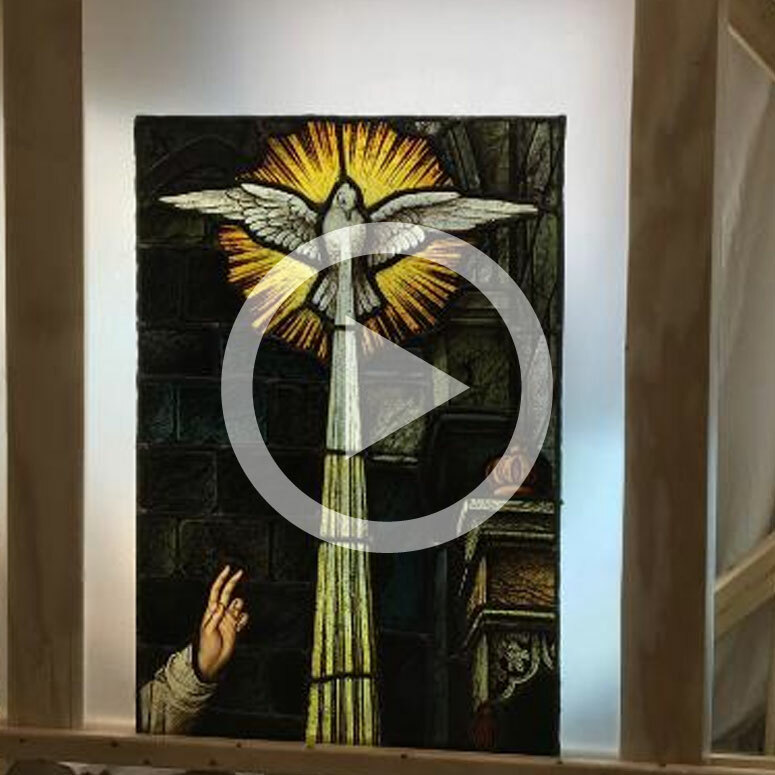 Inside Key City Creative Center, a small group of people are dedicated to restoring stained glass from the former St. Mary’s Church to its original beauty. It takes a delicate touch to scrape a piece of glass that’s more than 100 years old, and Mary Ellen Morrison has just that touch. “Getting the old paint off, getting prepared to go back in the window,” she explained of her work. Watching Morrison work on the glass, she might look like a seasoned pro. However, this is a relatively new skill for her. “I was in a dead end job before that I wasn’t happy with and I just you know wanted something that I felt was more suitable for me,” she said. Morrison says she feels stained glass refurbishing is very suitable for her, and she’s not alone. “All of the people working are from Dubuque, and none of them had stain glass experience before this project started,” Christine Happ Olson, Executive Director of Four Mounds Foundation said. Refurbished stained glass from St. Mary’s Church on Tuesday, November 28, 2017. Steeple Square partnered with different organizations, including Four Mounds, Fountain of Youth, Opening Doors, Heritage Works and more to find people who would want to learn the trade. Duane Hagerty, CEO of Heritage Works, says they brought in a stained glass professional from the Chicago area to train Dubuquers. “So we have a knowledge base, so we can go back and be able to repair windows if they need to be done, and continue to work on the project throughout and be able to train people in our community for that,” Happ Olson said. Once they’re done working on the windows at the studio inside Key City Creative Center, they take them to St. Mary’s where wood workers have spent hours restoring the wood trim, preparing for the glass to be put back into place. In all, everyone involved says the work is enjoyable, and they are happy to be making their mark on this historic church. “Hopefully it’ll be good for the next 150 years,” Morrison said. Along with the windows, the skills they’ve gained will last a lifetime, too.